Have The Dodgers Recaptured Some of That 2017 Late Game Magic? The Major league baseball season takes some weird twists and turns. Something has clicked with the Dodgers over the past couple of nights and I don’t know what it is. I’ll take it though and very glad that it’s happened. The 2018 Dodgers have mostly been a supremely frustrating and under performing club. 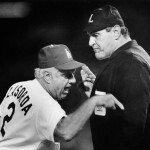 I recently wrote about the Dodger’s problems winning the close games. Of course as soon as I pen an article like that the Dodgers rally for back-to-back come from behind wins in as many days. I think I’ve found the solution here people, I’ll just keep writing articles pointing out the Dodger’s foibles. All kidding aside, something finally changed. At one point about a week and a half ago the Dodgers were blowing games left and right and sat 4.5 games behind the Snakes in the NL West. The Dodger’s primary weaknesses this season has been their relief pitching and inability to hit with runners in scoring position. The boys in blue were sinking fast and if you were betting on baseball you wouldn’t have bet the Dodgers were going to be in a position to win their sixth consecutive National League West crown. You wouldn’t have been wrong either. I had stated that the Dodgers were dead and buried. Perhaps I wasn’t exactly clear in what I meant. I meant that they seemed dead and buried because nobody had any confidence in them at the time based on how poorly they were playing. It seemed unlikely that they were going to just suddenly change on a dime. Nothing was improving at all. The 2017 Dodgers had an uncanny ability to get the big hits in the clutch situations. That’s why they came from behind in so many games. No deficit was insurmountable for those 2017 Dodgers and that is why they advanced to the World Series for the first time in 29 years. The 2018 Dodgers have been a different story entirely. They’ve been unable to hit with runners in scoring position all season long. They’ve been unable to come from behind late in games. They’ve been unable to score without hitting the home run. They’ve been consistently one of the worst clutch performers in MLB this season. It’s September now and it was looking like there was little hope of that changing. The first game of the series saw the Dodgers lose to the Dbacks 3-1 because of another dreadful offensive showing. That seemed to cement this prediction. As I noted above, something has changed. I don’t know what it was. Maybe they had some kind of closed door meeting? Or maybe they got sick of losing? Whatever it was, the Dodgers are showing some of the magic that they had in 2017. Are those pennant winning Dodgers back? The problem is still there though. The Dodgers used the long ball to mount those rallies over the last two games. Otherwise they still have issues with men on base. I’m looking on the positive side here because I’ve seen something finally click. 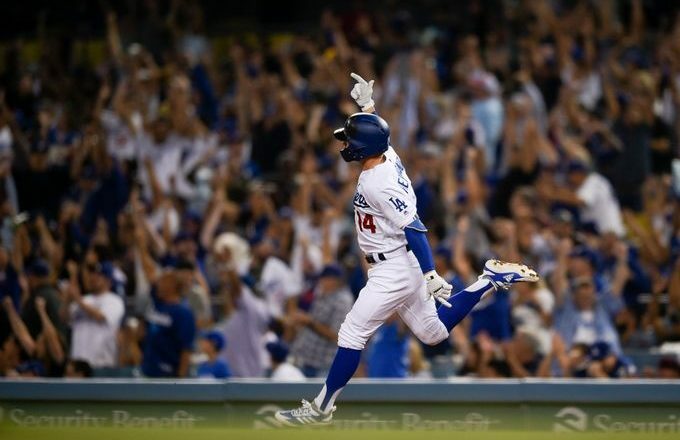 When Enrique Hernandez came off the bench to hit that pinch-hit solo home run to tie the game on Friday, it sparked the club. Sometimes one great play, or one big hit or home run can do the trick. Later in the next inning, Justin Turner smoked one out of the park to eventually give the Dodgers the win. On Saturday night the club found itself in the same situation. Down 2-0 in the bottom of the eighth, they needed another late game rally in order to stave off defeat. They got some great at-bats during that fateful frame. Turner’s single to right got the rally started. Manny Machado’s 10-pitch walk against Archie Bradley setup the Matt Kemp three-run home run that won the game. I know the Dodgers still haven’t proven they can hit with runners in scoring position. But they did something they weren’t previously doing. Even though they did it by hitting home runs, I still saw noticeable improvement. They didn’t just go down weakly. They had energy. They were aggressive. They took advantage of mistakes. Most importantly, they showed life. Perhaps this is the catalyst the Dodgers need for the remainder of the season. If the Dodgers continue to be aggressive, play with high energy and show a sense of urgency then they will be playing deep into October this fall. I saw something last night that was sadly lacking most of August. I saw enthusiasm on the bench. They were fired up from the night before. They were getting beat, but they did not look like a beaten team on the bench. Guys were yelling encouragement. Right before Kemp’s HR, the camera panned over to the dugout and one of the players, I can’t remember who, leaned over the rail and yelled come on Matty! I could not hear him yell, but reading his lips was easy. Next pitch, boom. I do not think that these two wins will in any way change who the 2018 Dodgers are, but I think it does show that they are not going down without a fight. That I like. But you still see the shrugged shoulders and downcast looks from guys like Grandal and Barnes and even Taylor when they strikeout, or leave runners on base. Taylor looks like he is mad at the world every single at bat, and I have not seen Grandal smile in weeks. It’s not your fault, Scott, all you can do is make the blog available and make a post every day or so. You can’t sign in for them or think up anything to write. I guess they just don’t want to support a blog. Too bad. It’s like having a clubhouse or cozy bar where friends come to talk about baseball and anything else that comes to mind. Well, that’s the way it’s supposed to be anyway. Nice try. I don’t know what Jonah is refering to but I think you do a great job and I enjoy your writeups and opinions. Stay after it, I am in your corner. Thanks package. Jonah is just miserable and hates having fun. Hopefully he starts feeling better soon. I’m not sure what you’re talking about Jonah but you’re a miserable man. You probably don’t realize how difficult it is to run and manage a blog every day. A lot of work goes into it and me and the crew over here work very hard to bring you guys a fun place to talk baseball and interesting articles to read. You’re certainly entitled to your opinion but try to be nice and not talk badly about the community you are a part of please. Thanks. Well, Kemp is out again. I cannot figure out why Dummy sees this as necessary. Kemp wins the game last night with a 3 run jack that that electricfies the crowd and the team so he says lets let him sit. It makes no sense. He hits righties and lefties basically the same so that is not it. Kemp sure as hell is not a sub waiting to get a chance. He damn sure can’t be tired. Kemp is an all star and should be playing every day down the stretch. Dummy is just a dummy and needs to go now. All I hear from some of you is what Kemp is not doing, not what he has done. Package, remember that conversation we had about a Cheerio the other day? Apparently Scott falls into that same category. My post was not derogatory to him in any way, on the contrary it applauded his efforts and bemoaned the lack of participation by readers who SOMETIMES (and not very often) post here. I am sorry for him that he couldn’t understand that but I am done here now, 100%. Wait a minute Jonah. I never thought when I commented that you were the problem or Scott. I took it that something had happened with someone else and I just wanted to let Scott know that I enjoyed his blog. No offense at all to you. I am sorry I started this. Forgive me please sir. jonah i though the cherrio comment was a fun and kidding way of expressing a though. In know in no way you were being disrespectful. I also enjoy reading Scott and package input on baseball knowledge. And keep up the humor jonah. Jonah does have a good sense of humor. Jonah was swallowed by the whale and has not found his way home yet. That was the first non-HR run by the Diamondback this series. This is baseball in 2018. Scott, I don’t post much, but I truly appreciate all of your efforts. You went above board when some of us were very vocal about the pop videos. Not many blog masters would have done that. It was much appreciated and probably not conveyed properly. It’s been a long season and a frustrating one. We don’t have 50 or 60 plus posters so some posts can be taken out of context. We need more voices on here as well as well thought out opinions. Everyone take a chill pill and hit reset. It’s September boys and girls!!! And it’s a penant race!!! Once again thank you Scott and crew!!! Thanks Tim, I appreciate the kind words. I hope you come around more often. Jonah and I both seem to have short fuses. I hope he’s not too upset. It was just a misunderstanding. a place to continue to hang out together. I know I don’t post very often, but I’m here every day. Thank you Rock! I appreciate that! Good to see you! Satisfied yet Double and 2 RBIs for Kemp and the game winner. No thanks to Dummy who decided he was only good enough to pinch hit. Not a HR Jeff, double OK.
What is your real point? Is he related to Puig? Sounds like he grew up in the same neighborhood or maybe it’s in the drinking water.